Meet my good friend David Elzey, children's author extraordinaire. Throngs of people have gathered together in the Vermont College dining hall to witness his incredible performance of an amazing magic trick, the Paper Clip Illusion. Here he is, holding an every day, nothing special, plain old white envelope and only five paper clips. One by one, David drops the paper clips into the envelope. Being the cagey fellow that he is, David puts the every day, nothing special, plain old white envelope and the five paper clips behind his back. After chanting his magic word Publishcio three times, he brings back around to face the audience. Ever so cautiously, David lifts the envelope flap and...oh, my goodness...how did that happen? The lunch room crowd breathes a collective, "Ooooooo." The paper clips are linked together! For real! It's magic! David was able to wow the crowd with this cool magic trick because of the ever-so-easy prep completed beforehand. Here's what you'll need to do. You already have the supplies needed for this illusion, right? Two identical white envelopes, tape, and 10 paper clips. What could be simpler? Linked and Non-linked paper clipsMove in closer to study those paper clips. Notice that five of the paper clips have been linked together and five of them are loose? Well, my dear friend, therein lies the trickiness of this trick. Hold on to your alacazam. I'll show you what I mean in just a moment. Neatly tape the envelopes together with the flat, address sides touching. See the two open flaps opposing one another? David concealed the trick's secret while performing this illusion by carefully keeping the side of the magic envelope containing the paper clip chain close to him while he dramatically dropped the loose paper clips into the empty side. When he put the magic envelope behind his back, David switched it around causing the paper clip chain side to face his mesmerized audience. Once again, he was very careful to keep the secret side of the magic envelope concealed as the dazzled crowd beheld the linked paper clip chain periously dangling from his fingertips. 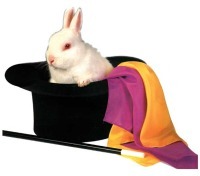 I know...the thrill of this trick is a far cry from pulling real rabbits of out of fancy hats. Look on the bright side. Have you ever cared for a rabbit? If so, then you know that, with this trick, the clean-up is a whole lot easier! This week let's have a bit more magical fun, shall we? Most of us don't have a silk top-hat or a furry white, pink-eyed rabbit sitting around the house to use as Simple Saturday supplies, do we? Fear not. We can still make some major magic using only two white envelopes, ten paper clips, and some tape. Truly...that's all we need...two white envelopes, ten paper clips, and some tape. So, go on . . .hop, hop, hop around the house, gather up these supplies, and meet me back here tomorrow morning.